A Child is the priceless gift of every parents. I hugged my child after I heard about the Peshawar incident. And yes, many things have changed in our life after our son came into our life. Before we were parents, we travelled and explored many places. Travelling was very easy for us but after our son was born, our unplanned trips were reduced. But even unplanned trips have its own fun and happiness. Holidays and picnic is the best way to experience a new place with your child. And these can be the moment for your children to remember in his whole life. All time studying, playing same games does not make your child open minded or clever. You need to take your child to some interesting places and make them to see the cultural of different region. I remember as a small kid our teacher used to give us assignments to go to some museums and make a note of it. Even during our picnics we were asked to make some observations and come back in class and submit them. Besides most of my summer holidays I did not waste time just sitting at home. Each and every summer holiday used to be the fun exploring new places where I had never been. Well so when it comes to make your child to enjoy the outing, it is important that we take care of each and every need. For instance when we go out, we can sure we carry his regular playing items like tennis ball or his cricket set to keep him entertained. When outdoors is not possible we also carry some games which can be played insides. Generally preferred is puzzle games so that learning can also happen and this puzzle games also keep him involved. One common things I always wonder Is why I should take our little one to outside activity. Well I think it is important that our little one interacts with the outside world. This can be done through picnics, taking him around the garden, showing the flora and fauna, teaching some good things about the wildlife. Well most of the things are covered in books but through this outings we can make out little ones connect the books to practical based on what they see and perceive. Well as adults most of us might prefer the junk food. But it is important that we give our little ones a healthy diet that is different from the regular food at home and at the same nutritious. It is not only important that we talk about the food but also “walk the talk” by eating healthy food with them. Start with a simple sandwich and some juices that can control the thirst. Kids love their tiffin boxes. Make sure the tiffin box this time has more varieties since it is a picnic time. Well most of feel hungry when we are out. So do the kids. Apart from the outdoor fun, the little ones also wish to enjoy snacks that not only feel their bellies before the next round of enjoyment but it also should fill its taste buds. The focus should be not on less quantity and more variety especially in a typical lunch menu for picnic. It is important that some kids might need small meals between the activities. When in a group I have seen that it varies upon the kids. I always prefer to carry dry fruits as they act as a healthy snack. I involved my little one sometimes in what he wants. So it is like 50% is his choice and the remaining I make a call. Make sure that the eatables that kids choose also are healthy. So I provide them a choice so that they pick up from the healthy and everyone is happy. I never wish to be in a situation when I am forced to get a food that is not healthy from outside when we are in picnic. Ultimate goal is to make sure that they are eating healthy every time. I sometimes feel lost seeing the energy of my little one that I forget the food timings. Overall I always make sure that I take the outdoor opportunity to not only have fun but provide some learning that can be used for future. I do not believe in being a teacher when outside. But rather learning with fun has its own advantage. I remember I told a story to my little one about a grandpa was injured once when he slipped on a banana skin. She remembered this and reminded me one day when I was about to commit this mistake and told the same to her friends when in school. The small ones are very fast in absorbing they information. We as parents should make sure that we not only plan the outings with out kids, but also make sure some lessons are imparted which can instill confidence and good manners. Finally I wish my little one to grow up as a adult who does not commit the horrific crimes that ashamed us. I do not wish to make my little one climb to an ideal person but I at least wish that he distinguishes between good and bad. But he mesmerizes me so much that some times I become a toy that moves as per his instructions. Love you son. 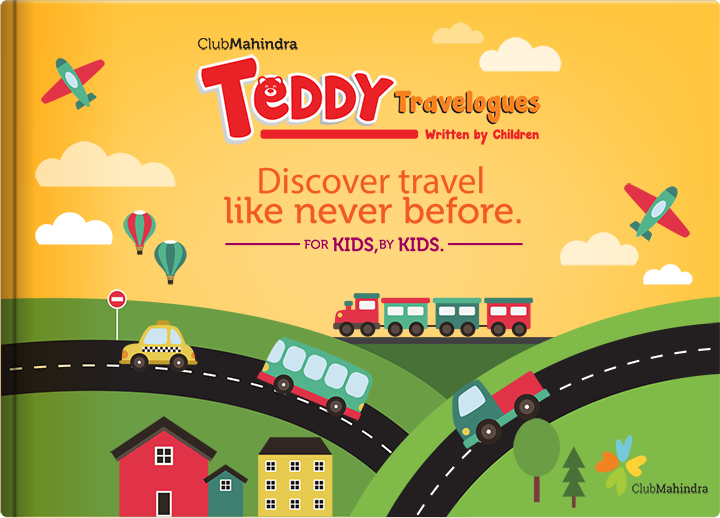 This post is written for Club Mahindra Teddy Travelogues hosted by Indiblogger.